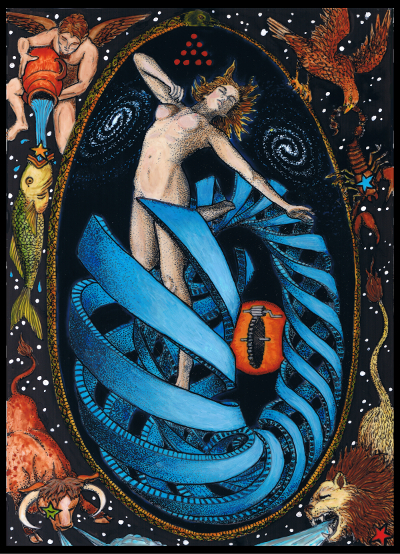 Tabula Mundi Tarot is available exclusively from Atu House. The Tabula Mundi store is located at The Tarot Cart. For all the keys of Atu House visit www.tarotcart.com. To see more detail about Tabula Mundi Tarot features and pricing, visit The Tarot Cart. I am wanting a notification when your full color deck is published and ready for purchase. Thanks. Stay tuned here, or subscribe to the newsletter, and you will be notified. I am hoping it will be available mid 2016. Nowhere to find/buy in Europe? All of my works are self published and completely created by me in small editions. So they are only purchasable directly from one of my sites such as http://www.tarotcart.com. I wish there was a way for me to sell from a place overseas so that European customers could save on shipping and related costs, but unfortunately I’ve not found a practical solution. However I do offer a choice of First Class shipping instead of Priority which saves a little of the postage cost. I definitely want both the full-size color Tabula Mundi (with extra Deccan Cards) and the Rosetta Tarots. I am heading out of town, but will be back in about a week. Will these items still be available (I live in the US)? Yes, they should be unless something unusual happens. Thanks for asking! Hello, I just ran accost these Taro Card images. I feel drawn to them and was wondering How I may obtain a deck. Thank you for sharing. I appreciate you time and consideration. They can be found currently only at http://www.tarotcart.com and http://www.rosettatarot.com. Thanks for asking!